Last night I was out to see Riley and figured I'd lunge him lightly. After all I have to do something with him after driving 40 minutes. Usually it's perfunctory and a bit ho-hum, but since he's been at the new barn he's been spooky. After a full month he's still anxious in the indoor -- not jumping around necessarily, but he shows the whites of his eye, and he's a little too "bright." Anyhoo, we were in ring with some other riders. 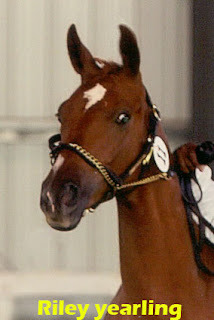 Whether it was the new digs, the cold, the other horses, or the instructor setting up jumps, my once poky pony was suddenly in the rafters, blowing hard, and ready to bolt. He took my breath away. It was probably the first real engagement I've seen him offer since he was three months old. He looked light, powerful, and uphill. He took my breath away. Riley had totally forgotten I was there. If I was ever nominally in charge holding the end of the line, I had no illusions of authority now. Unhinged by the woman moving large poles around, Riley was no longer circling me but darting in a crazy zig-zag, unable to decide where to go. Voice commands had no effect and all I could do was point the whip out to keep him from turning into the circle and mowing me down. I did eventually reel him in, and he seemed relieved to be part of our "herd of two." He chewed anxiously and kept looking over to the scary poles. Where is my lopey, goofy baby? The one that was calm coming off the trailer at our last show? I need to mentally adjust to this new personality, whether it's a phase or the "real" Riley. The bottom line is he intimidated the crap out of me last night and he didn't really even do anything. In the last month he has shown his spooky, non-sensible side and all of a sudden he doesn't look like he'll be an "easy" horse. Let's hope he calms down. I did put him on on a "diet" a while ago, and he has lost weight. He looks lean now but fit and healthy. Could he be feeling more energetic in his new bantam weight? Or could he be hungry and hyper-alert from that??? His new attitude could be a combination of everything at once. The new diet, new barn, scary poles,the indoor, cold weather etc... but whatever it is he will calm down eventually once he gets used to everything. I'm sure it's just a lot for a young guy to process all at once. I forgot to tell you that there is an award for you at my place, stop over when you get the chance and pick it up. 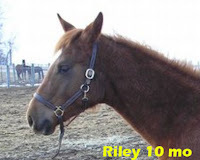 I have a two year old that is VERY quiet, and sounds like the way Riley was. However, after a few days in a stall (she is normally in a pasture). She was a handful. Luckily she settled back down. I am sure all the recent changes have stirred Riley up, and after all he is still just a baby. When they behave so well, it is easy to forget they are just youngsters. We also have a boarder who has a POA that gets squirrly during the cold months. They bought him during the fall and as the winter got colder he was very naughty. I couldn't believe that this fairly calm guy was so bad. As spring approached he started shaping up again. I can tell that this year he is also feeling really good, but we now have a year of good work into him so he isn't nearly as naughty as he was last year (fingers crossed). Stacey, it's likely the new place with new things to catch his attention. Check to see how much grain he's getting. One show barn I was in only fed a handful of grain to their jumpers and hunters, although they were up to their eyeballs in hay. I followed that regime of feeding oats when I got my place: it made life so much easier on horses that weren't tanked up on energy.